I am a big fan of celebrating life. Of extravagant love. Of tea parties just because. Of baking at midnight. This past Tuesday was Brian’s father’s birthday, and while his dad is no longer with us on earth, I felt compelled to honor his life in the small ways I knew how: icing a homemade cake while blasting Irish music. That’s the thing about food — it’s so much more than just something edible. It’s a way for us to nourish, cherish, and create memories. And this one was dedicated to David McCormack. 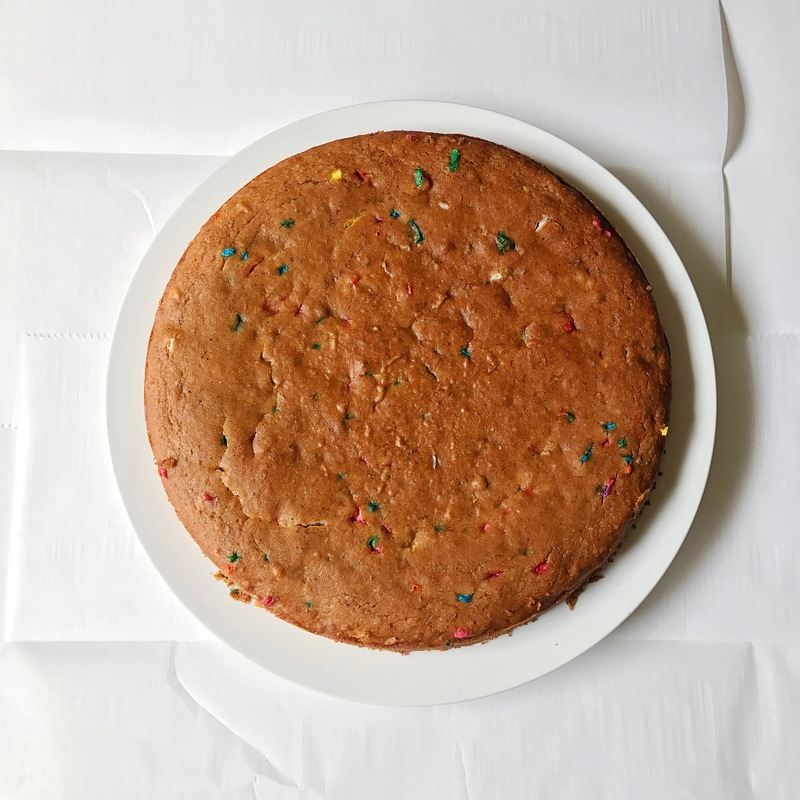 When I saw Candice Kumai’s recipe for vegan + gluten-free funfettti cake, I knew I had to give it a try. I followed her original recipe, but I swapped out the white sugar for coconut sugar and it turned out beautifully. Also, shoutout to Candice, the real MVP, for not judging me for Instagram messaging her late at night to ask recipe questions. Seriously — that woman is a rockstar. Coat one 9 inch round cake pans with unrefined coconut oil or baking spray. Then, cut a round parchment paper circle and set it down. In a mixing bowl, whisk your mashed banana, coconut oil, coconut sugar, water and vanilla extract. In a separate small mixing bowl, add the gluten free flour, almond meal, and salt. Gently add the dry ingredients into the wet bowl, mix until combined, but do not over mix. In a small bowl, combine the baking soda and apple cider vinegar mixture, allow the mixture to fizz and fold into the cake. 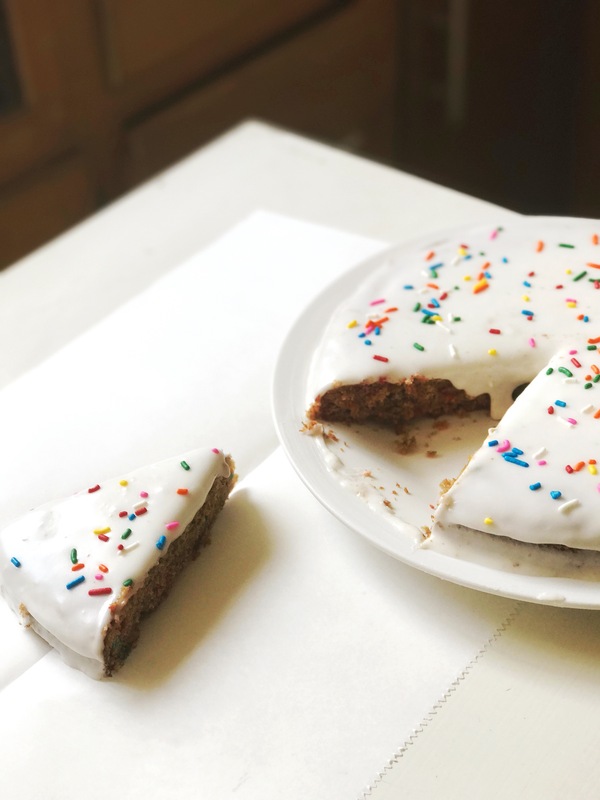 Gently fold in the multi-colored sprinkles. Pour the batter into the prepared cake pans, place into the 350 degree oven and bake for 30-35 minutes, or until the top is golden brown. Remove from the oven and cool completely (I let mine cool overnight). In a large mixing bowl, (or in a stand-mixer) add the powdered confectioner’s sugar, unrefined coconut oil and almond milk, whisk well with a power mixer or handheld whisk to combine. Add in apple cider vinegar to finish. Make sure icing is stiff. 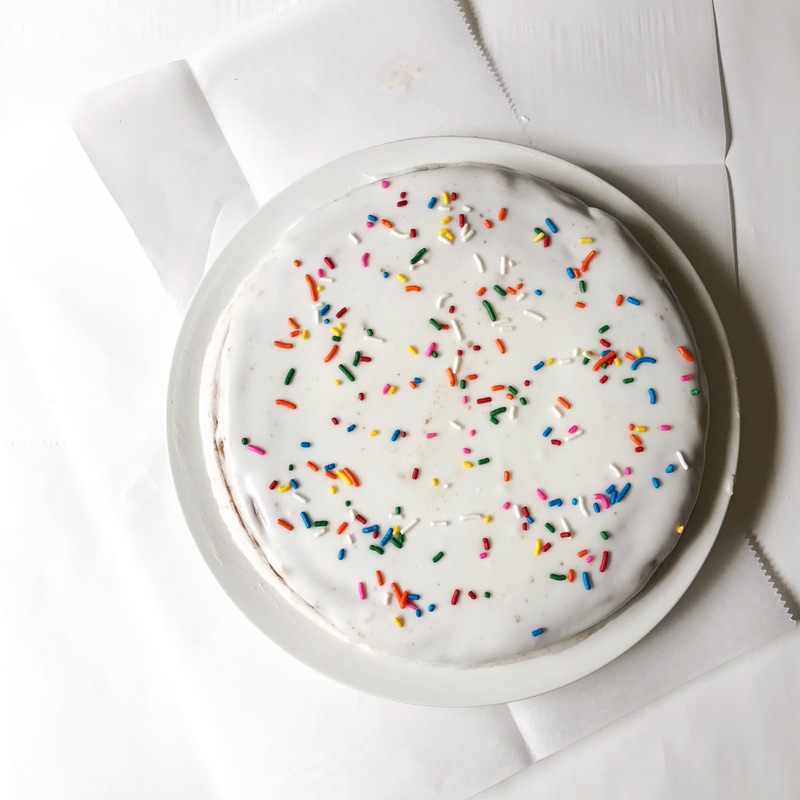 Using a spatula, ice your cake: Top, then sides and sprinkle with final rainbow sprinkles before the frosting hardens. As always, if you give the recipe a try or change it up at all, leave a comment below and let me know how you like it! I love hearing your variations and personal touches. Find something to honor and celebrate this week.